Even the most organized souls can still find themselves drowning in a sea of clippings and notebooks in search of one elusive idea. Curio Core 7 (Mac App Store link) consolidates your thoughts into one useful digital space. Despite its arsenal of options, it mostly balances those powerful abilities with admirable ease of use. Each of Curio Core’s Project files houses a series of Idea Spaces for your work. Like many of its other elements, Curio lets you choose from a variety of preset Idea Space styles, from slick PowerPoint-style background gradients to replicas of notebook and graph paper. You can then tweak and save those styles as your own custom options. UI: Curio Core 7’s friendly and well-designed interface nonetheless crowds out your working space on smaller monitors. Within each Idea Space, you can store hierarchical information either as a bullet-pointed list or a flowchart-like Mind Map, and convert the same information from one form to the other and back again. You can also create simple tables for more complex data, or drop in index cards for brief thoughts and observations. For power users, Curio Core lets you import Lists and Mind Maps directly from CSV and OPML files. From a palette on the right side of the screen, you can change any of these items’ colors, fonts, shapes, outlines, drop shadows, and more. Metadata lets you tag elements so they’re easy to find in subsequent searches; add check boxes and progress icons to help track how much you’ve gotten done; and append icons to highlight certain pieces of information. 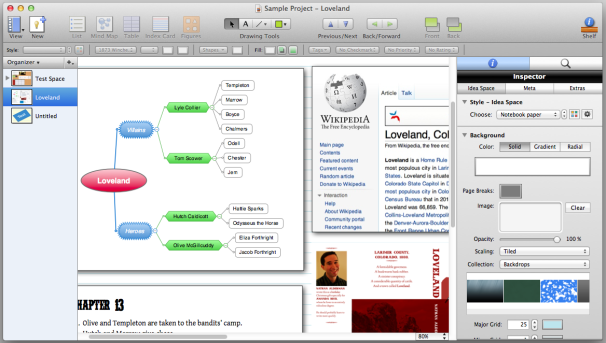 Change the font, color, or text size within one branch of a Mind Map or list, and all subsequent elements on that level look the same. In addition, Curio Core offers basic vector graphics tools. You can resize and rotate any element, and draw various different shapes, along with multisegmented lines that switch dynamically from curves to straight sections as you specify. 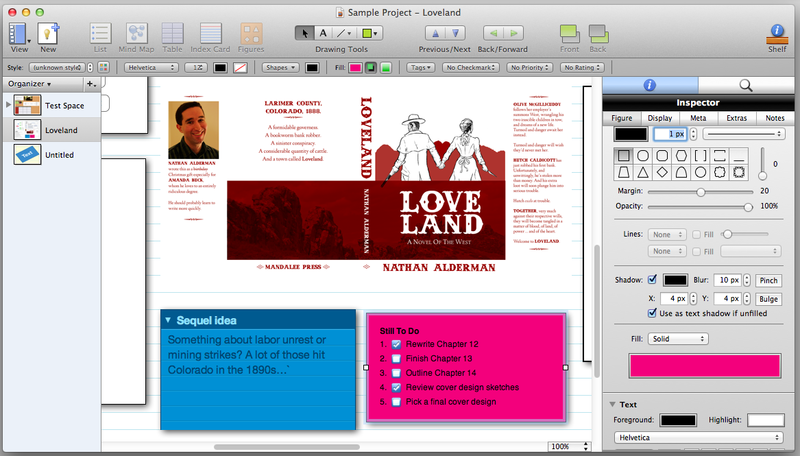 Curio Core supports dragging and dropping images, PDFs, QuickTime movies, and other files into Idea Spaces. 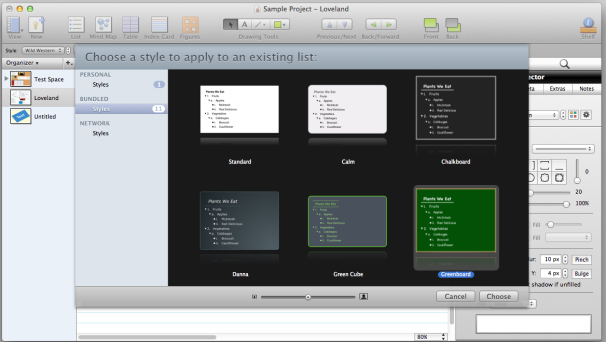 More impressively, you can also insert live previews of Adobe Creative Suite, Apple iWork, and Microsoft Office files. Clicking on each preview will open the respective file within its native program, and any changes you make there will show up again in Curio Core when you save and close. You can even add interactive Web page views and Google Docs windows within Idea Spaces, via a Safari-like interface. Makeover: Style galleries let you set an element’s look with a few simple clicks. Want to share your thoughts with others? Curio Core exports to Web pages, images, PDFs, and even iPhoto albums. There’s no iCloud integration yet, but Curio Core will publish straight to Mobile Me. Feeling lost? Curio Core has clear and comprehensive help files. A friendly Getting Started guide walks you through the program’s easy interface, demonstrating how Curio Core can help you write term papers, create interactive workbooks for schoolkids, track research and business projects, and even plan home remodeling. However, Curio Core’s status as the entry-level version of an increasingly sophisticated spectrum of programs also works against it. Core’s limited features pack plenty of power, but Curio’s makers decided to write one user manual for three different programs with varying tiers of features. In some cases, they’re kind enough to label which programs offer which abilities. In others, you’re left guessing, and usually disappointed. If the impressive-looking bells and whistles in Curio’s Standard and Pro versions tempt you, you’ll find options to upgrade from Core in the online store at Zengobi’s Web site. Once I’d gotten the hang of the program, it took me only a few minutes to pull together Web pages, PDFs, to-do lists, and character charts as a notebook for a novel-in-progress. However, I encountered a few quirks along the way. On a 13-inch laptop, the available screen real estate just isn’t enough to see the whole Idea Space. A hotkey that toggles the surrounding palettes on and off helps, but switching back and forth gets old fast. And while Curio Core’s manual and Getting Started guide tout multitouch gesture support for resizing or rotating objects, they don’t mention that you’ll have to first hunt for and enable this feature amid a sea of other checkboxes in the program’s preferences. I also had a little trouble with video. When I first dropped a small QuickTime movie into an Idea Space, it wouldn’t play at all. The second time, the entire program froze. The third time proved the charm, as did all subsequent attempts to work with that and other videos. Customize: You can easily customize nearly every aspect of Curio’s various elements. At nearly $40, Curio Core is one of the more expensive organizer options in the Mac App Store. But it’s not the priciest; it offers a lot more features than many cheaper apps; and it presents them in a friendly, easy-to-learn package. If you want to get the best of your next massive project, consider Curio Core a great place to start.